Automated Keyword Workflows let you trigger multiple auto-response messages when someone joins through your Keyword. There are two kinds of steps in a Keyword Workflow: send a basic auto-response message or collect data. 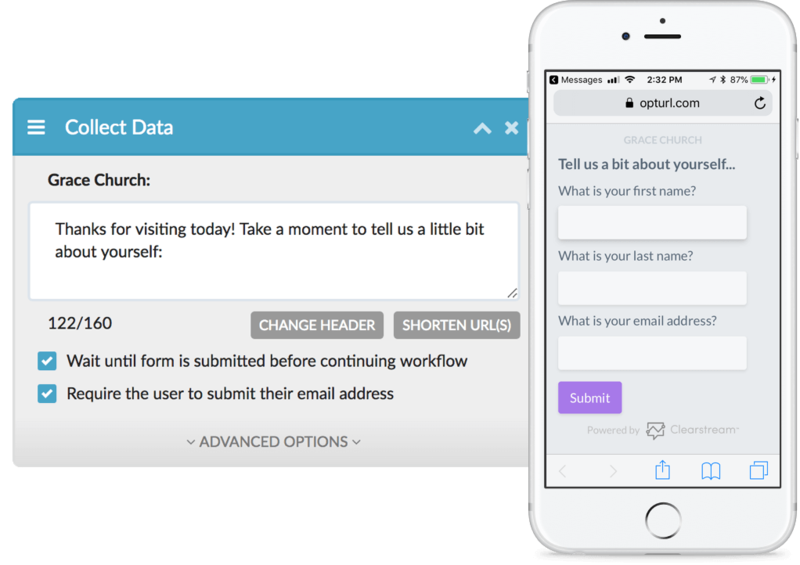 When using the "Collect Data" step, a URL will be automatically added to your auto-response message. When a subscriber clicks on the URL, they will be taken to a page where they can fill out their first/last name, and email address. After a subscriber fills out the form, their information will be tied to their subscriber profile, which can be found by going to the List they joined in the Subscribers page. If your church uses Planning Center you can automatically push the collected info into Planning Center to automatically create a new Person in your Planning Center account and optionally add them one of your Planning Center Workflows. If you collect this data from new subscribers, you'll be able to export the data as an Excel file (Subscribers > Export), or you can sync with Mailchimp. This is helpful if you use Mailchimp to send emails and Clearstream to send text messages.